We all know it’s better to have a little cushion in our budget. What we don’t all know -or what we don’t yet believe- is that we can all have one. Well believe it! You can save up a one month cushion and EEBA can help, here’s how. Building up a one month cushion starts with earning more than you spend. With EEBA, that means having a budget that spends less than your income. Head to the Edit Budget page and check your existing budget to make sure the amounts you’ve planned to spend each budgeting period makes sense. 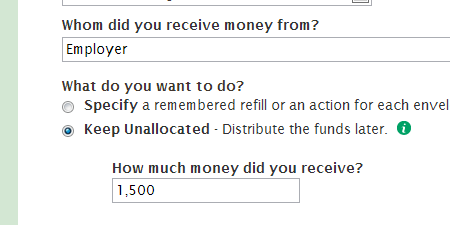 You can find your total budgeted amount at the bottom of the page. If you’re currently spending more than your income, this will mean making some hard choices about what to cut. Use the information you’ve built up in EEBA to help you make those decisions with those around you. With the right information you can move past arguing about spending, and have conversations about the choices that matter. If this is your first time budgeting, we’d recommend starting with a budget based off your current spending. That will give you an accurate picture of where you are today, and provide the information you need to make changes for tomorrow. Learn more about creating a budget. Once your budget makes sense, all that’s left is to stick with it. The key here is to give your budget the room to adapt to what life gives you. The best way to do that is by using EEBA’s Unallocated Money feature. When you receive your income, head to the Add Money / Receive Income page and choose “Keep Unallocated” to gather your income before distributing it to your Envelopes. 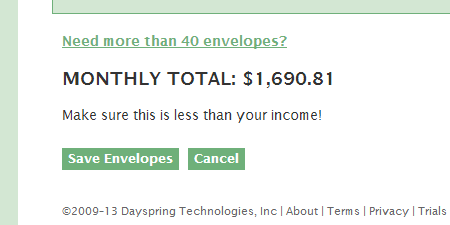 This will let you be flexible with how you fill your Envelopes, making changes mid-stream if things come up. At the start of each budgeting period, or as you need to, distribute money from your Unallocated into your Envelopes. Prioritize the expenses you need to pay before your next paycheck and leave a remainder aside when you can. If your budget is less than your income, then over time this remainder will grow and build up to a one month cushion. Most importantly, be kind to yourself! Give yourself -and your budget- the room to make mistakes and adjust as necessary. Building up a one month cushion isn’t like taking a test that you pass for fail. It’s a daily choice to move in the right direction. Use EEBA to help you make the right decisions day after day. I absolutely LOVE EEBA! All the tips and links are so helpful and I like the fact they let you know making mistakes is okay and to be realistic about your expectations. This is a GREAT service, thank you very much!